The digital turn in filmmaking provides the potential to communicate a posthuman perspective on the interrelationship between human and nonhuman realities. The fluid sense of interconnection that defines this expanded subject position has been defined variously by scholars of the posthuman. In her landmark 1999 work How We Became Posthuman, Katherine N. Hayles describes the posthuman as ‘an amalgam’, a ‘material-information entity whose boundaries undergo continuous construction and reconstruction’. The breakdown of a stable subject position is also explored in Rosi Braidotti’s The Posthuman (2010), in which she uses the notion of ‘nomadic subjectivity’ to describe ‘an enlarged sense of interconnection between self and others’. Continuing her project of thinking across species, in Staying with the Trouble (2016) Donna Haraway insists upon the need to harness shared capabilities across species in order to survive and flourish for future generations. It is clear, then, that posthumanism demands that the notion of the human is expanded to include other nonhuman subjectivities. I argue here that the hybridity inherent in the posthuman subject position is brought into sharp relief by the aesthetic experience of CGI. What is CGI and how has it changed cinema? The computer generated image is not physically filmed by a camera, but instead created digitally and composited into the image in the editing stage of the production process. CGI can either be layered into a live action image – one filmed by the physical camera – such as the dinosaurs in Jurassic Park (Steven Spielberg, 1993), or a sequence or film can be wholly computer generated, such as the films of Pixar. Another important aspect of the digital turn is that the presence of a physical camera is no longer guaranteed. Dudley Andrew explains how in digital cinema it is often the case that now ‘cameras play only an ancillary role’, and the image is made up of ‘computer rearrangements of a number of contributing visual elements’, only some of which are filmed by a physical camera. Within film studies, William Brown and Tobey Crockett have indicated the posthuman perspective opened up by CGI. In his 2013 book Supercinema Brown analyses the opening sequence of Fight Club (David Fincher, 1999), in which the camera penetrates a human body as well as other solid objects such as the walls and floors of a building. The virtual camera of CGI can move through apparently solid objects as easily as it can through empty space. As viewed by this phantasmal camera, the human body is shown to exist in a continuum with other objects around it. As such, Brown argues that rather than a ‘space fragmented by objects, digital technology suggests the inherently connected nature of those objects and their surroundings’. This enlarged perspective evokes Braidotti’s notion of nomadic subjectivity, a position that acknowledges ‘the ties that bind us to the multiple “others”’. The fluid continuum of life and matter evoked by CGI reveals the ‘vital web of complex interrelations’ that constitutes the posthuman subject position. The posthuman perspective afforded by CGI is also discussed by Crockett in his 2009 essay ‘The “Camera as Camera”’, in which he argues that a posthuman agency is generated in films including The Lord of the Rings: The Fellowship of the Ring (Peter Jackson, 2001), The Matrix Reloaded (The Wachowski Sisters, 2003) and The Polar Express (Robert Zemeckis, 2004). He argues that by harnessing the potential of CGI, such films have revolutionised ‘the world as we know it’. By ‘Camera as Camera’ Crockett means that the virtual camera has different ontological as well as aesthetic properties to its mechanical, physical counterpart. Rather than being tied to a fixed location in space, through the intricate acrobatics of miniscule calculations any pixel on the screen can become a virtual camera. The pixel thus takes on an agency that was never afforded to physical film, ‘rewriting the subject-object split, and annihilating it’. For Crockett, the difference between subject and object, or human and world, is eradicated when every part of space becomes a potential agent, pointing away from ‘a Cartesian reality in which our human hegemony dominates all’ and towards a more fluid sense of subjectivity that includes and exceeds the human. Thus, while Brown demonstrates how the virtual camera of CGI has the potential to reveal the interconnected relationship between all life, placing the human on the same continuum as all matter, Crockett specifies the pixel as constituting a posthuman agency. To conclude this discussion of the posthuman potential of CGI, I will now turn to a contemporary case study. Alfonso Cuáron’s Gravity (2013) is a film that dramatises the plight of the human in an environment inimical to organic life. The camera draws attention to its virtual nature at certain moments in the film, decentring the notion of a privileged, anthropocentric view of space. 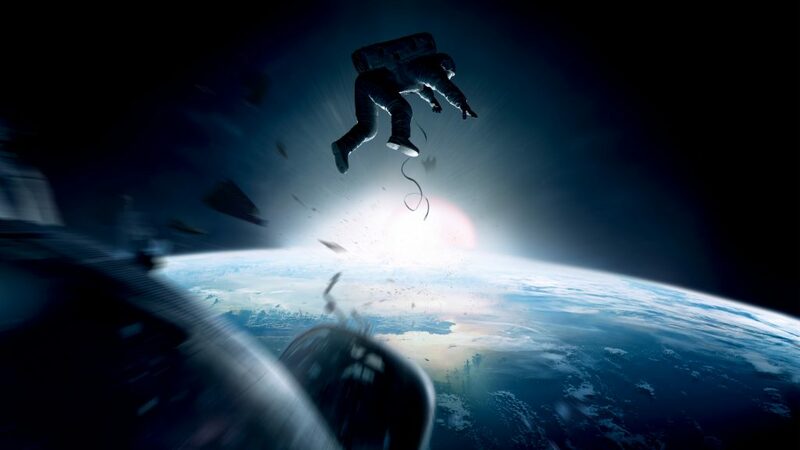 After the film’s protagonist Ryan Stone (Sandra Bullock) becomes untethered from the destroyed Hubble telescope – detached from a fixed point in space – the electric lights on Earth and light of the sun spin around her as the camera tightens on her face. The camera then penetrates the transparent barrier of Stone’s visor and gradually adopts her point of view as it pivots inside the helmet. Space, helmet and human body are fluidly adopted by the virtual camera. Similar to Crockett’s pixel, this movement reveals Brown’s notion that CGI has the potential to show the fundamentally interconnected reality of objects in space, including the human. The human subject is not regarded as separate from the objects that surround them and the ‘result of this “decentring” is a minimizing of anthropocentrism in digital cinema’. In this example from Gravity, then, Stone’s human perception is shown to exist in a continuum with nonhuman space, providing a posthuman perspective of fluidity and interconnection. Developing on the film examples of Brown and Crockett though, in this sequence from Gravity the camera penetrates a necessary barrier to protect human life: the visor that separates Stone from Space. The virtual camera thus not only decentres human subjectivity, but penetrates an environment that both sustains and is radically indifferent to human life. Such an aesthetic statement of human contingency resonates with the kind of posthuman subject position that Hayles, Braidotti and Haraway advocate. In order for an expanded, hybrid and interconnected subject to be generated, an unmitigated collapse of the human as master of all spaces is required. Katherine N. Hayles, How We Became Posthuman: Virtual Bodies in Cybernetics, Literature, and Informatics (Chicago: University of Chicago Press, 1999), p. 3. Rosi Braidotti, The Posthuman (Cambridge: Polity, 2013), p. 49. Donna J. Haraway, Staying with the Trouble: Making Kin in the Chthulucene (London and Durham: Duke University Press, 2016). See, for example, p. 12. Dudley Andrew, What Cinema Is! (Oxford: Wiley-Blackwell, 2010), p. 2. William Brown, Supercinema: Film-Philosophy for the Digital Age (Oxford: Berghahn Books, 2013), p. 2. Braidotti, The Posthuman, p. 49. Tobey Crockett, ‘The “Camera as Camera”: How CGI Changes the World As We Know It’, in Cinephilia in the Age of Digital Reproduction: Film, Pleasure and Digital Culture, Vol. 1, ed. by S. Balcerzak and J. Sperbs (London: Wallflower, 2009), p. 119.